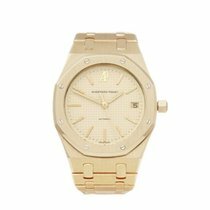 This is a pre-owned Audemars Piguet Royal Oak ladies 67651ST.ZZ.D002CR.01 watch. 33mm case size in stainless steel, black baton dial on a black leather bracelet, powered by a quartz movement. This Audemars Piguet is in good condition complete with xupes presentation box. Circa 2010's. Our Xupes reference is W5567 should you need to quote this.